Endothelial dysfunction can lead to a retention of oxidized low-density lipoprotein (oxLDL) in the arterial wall. Monocytes are recruited to the atherosclerotic lesion and differentiate into macrophages. These phagocytes accumulate through local proliferation and ingest oxLDL, thus transforming into foam cells. mTOR-Inhibitors not only inhibit monocyte migration, macrophage proliferation and foam cell formation, but also induce depletion of phagocytes by autophagy. Immunosuppressants like mTOR inhibitors, as well as an increasing number of modern pipeline active pharmaceutical ingredients (API) can be classified according to the Biopharmaceutical Classification System as Class II substances. Due to their lipophilic nature, high molecular weight and poor water solubility, the employment in cell culture or in-vivo settings can be difficult. The handling of hydrophobic drugs is simplified by the use of nano-formulations such as liposomes, nanoemulsions or nanocrystals. However, rapid clearing by the immune system, limited drug capacity, and adverse immune effects can impede in-vivo efficacy. 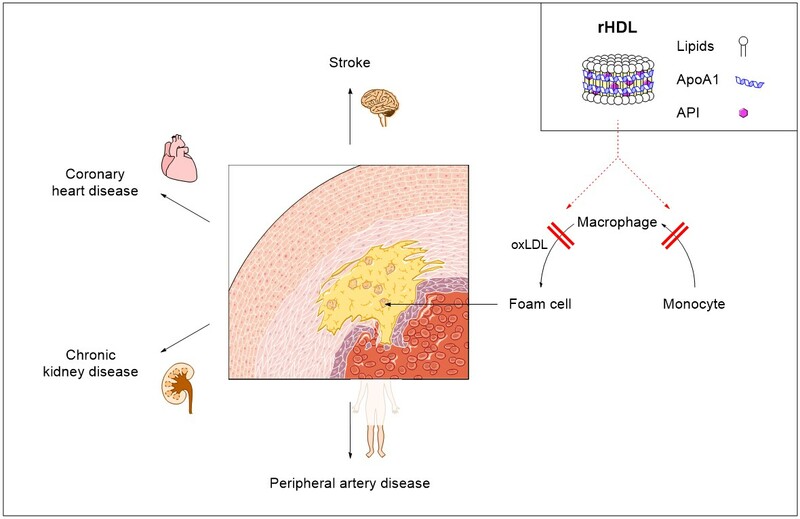 The endogenic nanocarrier high-density lipoprotein (HDL) shows long circulation times, a high capacity for hydrophobic cargo, and excellent biocompatibility. Reconstituted HDL (rHDL) can be prepared in-vitro and hydrophobic APIs can be incorporated in the core of the 10 nm nanodiscs. The preparation is achieved by the interaction of Apolipoprotein A1 (ApoA1) with lipids. rHDL shows a targeting effect to atherosclerotic plaques due to the interaction of ApoA1 with structures found on foam-cells or plaque endothelial cells (e.g. SR-BI) but can also be functionalized with a variety of targeting moieties. Therefore, rHDL can be used as a versatile vehicle for the targeted delivery of hydrophobic APIs.